Is your child safe? The Doc Smitty looks at medication errors. Those are 2 conversations that happen frequently and just yesterday, respectively, in my house. A study released this month in Pediatrics (the journal of the American Academy of Pediatrics) looked at out-of-hospital medication errors in patients less than 6 years of age. How common are medication errors? Almost 700,000 errors in these children over the 10 year period, that is equal to 1 error every 8 minutes. Many of these were minor and required no medical care, but there were almost 2,000 children who required intensive care and 25 death due to medication errors. What type of medications were associated with more errors? Liquid medications were the most common, accounting for 81.9% of the errors. These kids are more likely to be taking liquid medications so this might be expected but it’s still a good reminder we need to be cautious. Where do the ingestions occur? The child’s own home was the location of the ingestions 96.9% of the time. What errors were the most common? Confused the units of measure (1 milliliters (mL) vs 1 teaspoon (tsp). Accidentally was given or took someone else’s medicine. So what can you do to protect your child? Be aware. These errors are common and we need to be aware. Be cautious with liquid medications. 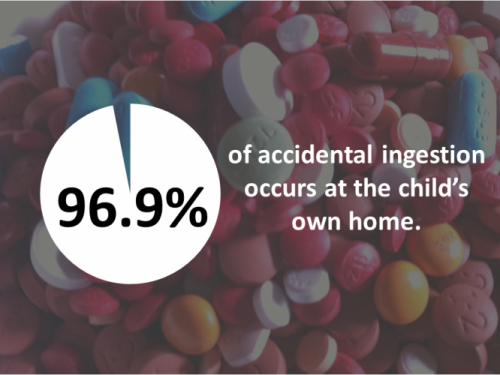 Kids can find and ingest them more easily and dosing errors are more common. Protect your own home. Make sure that medications are locked away in a safe place. Double, triple and quadruple check your dosing. You know the saying measure twice and cut once? For meds it should be measure 5x and give once. Assign a primary medication giver for the house. If anyone else is giving meds, run it through them first.